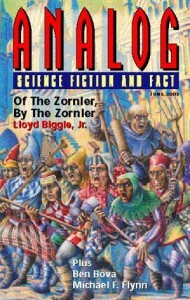 Lloyd Biggle, Jr. Of the Zornler, By the Zornler. Another tale in the ‘Interplanetary Relations Bureau’, stories in which planets of varying degrees of alienness have the benefit of intervention by said agency. 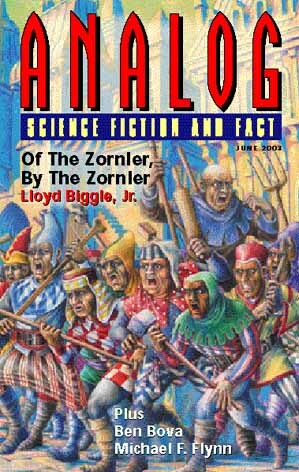 On the planet Zornley, a dead-ringer for medieval Europe, a relatively inexperienced operative of the Bureau decides to experiment with imposing demoncracy on the Zorns. For their part the Zorns have been managing quite happily for centuries, and his meddling is not quite as easy as he had anticipated. In the end the operative decides that it’s all too much hassle, and imposes a solution. Charles E. Gannon. The Power of Vision. The first part of the story sees a terrorist attack on a nuclear facility prevented at the last minute by the heroics of the protagonist, a hi-tech law enforcement officer. (The nuclear facility had a flaw in the defences, which the terrorists were trying to exploit: their radar didn’t cover ground-hugging missiles. I mean, duh). Colonel Wilder doesn’t do everything by the regs, and has a confrontation with some men in suits, but bests them. And the final section sees Wilder quoting the Qu’ran at the terrorist, for you see, not only is Colonel Wilder an all-action hero, he is a clever chap as well. This final section becomes increasingly unlikely, as Wilder attempts to persuade the terrorist to seeing the errors of his ways. He doesn’t succeed with the terrorist, and he didn’t succeed with me. The final paragraphs see Wilder putting forward the thesis that parents will choose the welfare of their children above everything else, which rather fails to appreciate the fact that when parents are is in such a dire state of oppression as many are throughout the world, the sacrifice a child makes, with the blessing of their God, is a sacrifice which many parents do tolerate. Adrift in space, a delivery vessel and its one-man crew look doomed. However, rescue is at hand. In this case, from an unlikely source, as a star-crossed lover, a Dear John letter in his hand, is the saviour. Michael F. Flynn. 3rd Corinthians. A priest visits an Irish pub for a glass or two of the black stuff to calm his nerves. A theological debate about the veracity of the Bible takes place, in particular regarding the authorship parts thereof. It transpires that a new document, purporting to be 3rd Corinthians, has been found. But there is something particularly strange about it, and it would appear that strange forces have been at hand. Not being a fantasy fan, particularly of the ‘fat’ kind, I’ve not read either Bible, or Bible II: the New Testament, so I’m not that familiar with the source material. I have seen a few film versions though, and did read the Frank Herbert version, which I believe came out in the States and is preferred to the King James version the people refer to here in the UK. Peter D. Manison. Punctured Equilibrium. The threat to humanity is such that desperate measures are being taken to ensure the future of the species. One such attempt is to load as much knowledge about ourselves and our technology onto an asteroid and to send it on a long journey. When it returns, a century hence, humanity, should we be in reduced circumstances, would be able to ‘bootstrap’ ourselves back up the technology ladder. Humanity, in the shape of Felix and Hannah, is facing a turning point in its existence. The turning point relates to our Universe reaching its mid-way point, and reversing is causal direction. Trust the author on this one, even thought the explanation is doubtless not the most rigorous. As Hannah departs, and leaves, Felix is left behind – until, that is, a doppelganger-Hannah, headed in the opposite direction, turns up. Their relationship is problematic due to their seeing events from different perspectives, but, as ever, humanity, and that truest essence of humanity, love, finds a way. Edward M. Lerner. By the Rules. Lerner has produced a steady stream of science thrillers, but is treading on thin ice here, and running the risk of being expelled from the Analog writer’s club. His main character is of course a scientist, but the scientist in question is a … social scientist! And worse, he is not only doing qualitative research, but ethnographic research! Lerner helpfully provides background information on this research paradigm, to help his readers). Mind you, he does also explain the Drake Equation and Fermi’s Paradox, which is somewhat like preaching to the converted). You may well be wondering how ethnographic research and Drake/Fermi come together, and the answer is in a neat way. The protagonist is carrying out research into Internet chat-rooms, and the discourse analysis provides some intriguing results. No, not that people inhabiting Internet chatrooms are isolated, social inadequates, that wouldn’t be a surprise. The surprise is that amongst UFOlogist chat-rooms, the debunking which is going on all seems to emanate from one person using a variety of aliases. But further analysis from a wider sample shows that the same person is fluent in many languages, and has been debunking for many, many years. The conclusion: an alien visitor is doing their best to nix the concept of alien life. Ben Bova. Sam and the Flying Dutchman. Classic-style SF fun. The irrepressible Sam Gunn (my heart tends to sink when I see an introduction to a story of that ilk) heads off on another adventure. He is running away from an erstwhile wife-to-be, and gets caught up, with his mate, in cross-fire between an ex-husband and current husband of a beautiful billionairess, etc etc. Not a bad issue all in all. Melton, Manison, Wharton and Lerner provide something slightly different to the usual fayre. Biggle, Gannon, and Bova are run of the mill. Gannon takes a Bruce Willis/Die Hard approach to sorting out post-9.11, only a couple of weeks after the ‘Coalition’ tried that in Iraq.